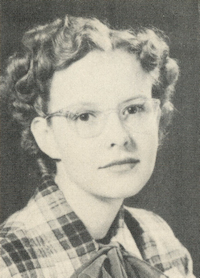 Obituary – Green, Doris “Arlene” (Harrah) « Perry High School Alumni Association, Inc.
﻿Band ’48-’49; Y-Teens ’45-’48; F. T. A. Secretary ’48-’49; Home Room Secretary ’48-’49. Doris “Arlene” Green, 80, of Perry, Oklahoma was the daughter of Samuel Sanford and Minnie Emma (Keyser) Harrah. She was born July 26, 1931 five miles north of Perry in Noble County Oklahoma and passed away Thursday, November 24, 2011 at the Perry Green Valley Nursing Home. Arlene worked as a secretary for the Methodist Church and the OSU Extension Center. She enjoyed reading autobiographies, working crossword puzzles, and music, both playing piano and singing. She loved to cook “anything that turned out good” and her favorite recipe was a Chocolate Sheet Cake which she shared with her family and friends. She was preceded in death by her parents and her three brothers, Bill, Ted, and Raymond. Survivors include two daughters, Marianne Kirkpatrick and husband David of Beaumont, Texas and Lynn Downey of Perry, OK; two grandchildren, Elizabeth Frazier and husband Robbie and Joseph Kirkpatrick; two great grandsons Garrett and Cameron Frazier; several nieces and nephews and a special caregiver Einstein. The family suggests memorials be given to the Judith Karman Hospice or the Will Rogers Council Boy Scout Troop 12 in care of the Perry Funeral Home 203 E. Fir St., Perry, OK.